I’ve always had a soft spot for minor fruit – things like paw paws, mulberries, persimmons, elderberries, gooseberries, etc. that taste wonderful and grow easily organically in our area, but for one reason or another have not been bred for market. Some like the paw paws can’t take handling, others take too long to pay someone to harvest and are only suited for kids or homesteaders to pick and eat on the spot. Stratton seems to be another fan of such fruits. 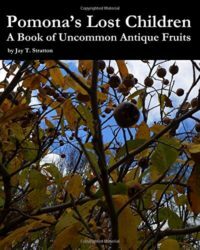 This book contains a chapter on each of the above (except mulberries), plus ones on currants, black cur-rants, quince, blackberries, medlar, jostaberries, saskatoon, and cornel. He also includes a few paragraphs on wild black cherry, chokecherry, mayhaw, rosehips, rowanberry, and rowan dream. Each fruit is given loving treatment with a combination of childhood memories, fruit descriptions, history and facts, interesting digressions, and then probably the most useful part of all – the recipes. A good third to half of the book is devoted to ways to use these fruits – foods they can go with well, and ways to make simple pastries, jellies, puddings, confections, drinks, sauces and wines. One can read this casually and just enjoy Stratton’s memories and fondness for these fruits. Or one can easily enough order some of these bushes and trees and soon be picking and making the delicious concoctions he mentions. Even better, if you have some of these already in your backyard, as we do, you can vow to surprise your neighbors next get-together with red currant eggedosis, persimmon pudding, gooseberry pie, or elder fruit soup. Stratton obviously had a good time writing and illustrating this book (it is graced with nice little line drawings of fruits, trees and bushes, and confections which give it a warm feel). He Is a retired teacher as well as an amateur botanist, farmer, and forester and brings you into his world. It would be a lovely present for a homesteader you know!